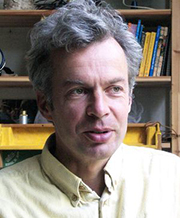 Evert Bloemsma, 1958–2005. By historical standards, the FontFont library is a quite young library. Most of the designers behind it were still at school when digital type started to free type design and production from its industrial constraints and the division of labour. Among those young designers, Evert Bloemsma was one of oldest and most experienced. He digitized his first face at URW in 1987, still on a big mainframe computer. The FontFont library released all his peculiar faces: FF Balance (1993), FF Cocon (1998/2001), FF Avance (2000), FF Legato (2004). All of Evert’s work was concerned with finding new answers to the old challenges of reading under various conditions, in different media. FF Legato has already been complimented not only as his most mature design to date, but also as a radical new way of designing the white space, paying as much attention to counter shapes as to the black marks on the page. In his prime and at the height of his profession, Evert died suddenly at his home in Arnhem, Netherlands.